2 year parts & labour warranty as standard Type "A" break tank to comply with current water reg..
Sherwood Compact Passthrough Dishwasher Optional WRAS Approved Type "A" break tank to comply with c.. The Classeq D400 is a compact, front loading commercial dishwasher, the perfect dishwasher where spa.. 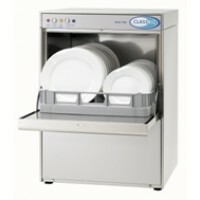 The Classeq D500 compact commercial dishwashers are top specification, British made commerical .. The Classeq D500 Duo compact commercial dishwashers are top specification, British made commerical d.. The Classeq Hydro 500 dishwasher has a 400x400mm basket capable of holding 9 dinner plates or 18 pin.. The Classeq Hydro 700 has been designed specifically to run on a 13 amp, 3 pin plug, this dishwasher.. The Classeq Hydro 750 dishwasher is a high volume commercial dishwasher capable of washing 18 dinner.. The Classeq Hydro 857 is a high volume passthrough dishwasher capable of washing 720 plates per per .. The Classeq Hydro 957 is a high volume 3 phase passthrough dishwasher capable of washing 720 pl.. The Classeq Viso 50 untensil washer has a 400mm wash chamber height, 500mm width & 600mm de.. The Classeq Viso 55H untensil washer has a large 850mm wash chamber height, 550mm width & 6100mm.. The Classeq Viso 70 untensil washer has a 650mm wash chamber height, 700mm width & 700mm de.. The 400x400mm basket Eurowash 340 commercial dishwashers offer outstanding performance & durabil.. The Eurowash 363BT commercial dishwasher with a WRAS approved type A break tank fitted as standard o.. Lease Purchase from £8.88+vat per week £8.88 per week - 1 year onsite warranty or £10.66 per week.. The Classeq Duo compact commercial dishwashers are top specification, British made commerical dishwa.. The Classeq Viso 130 untensil washer has a 650mm wash chamber height, 1320mm width & 700mm ..